Each new day we keep looking for ways of investigating scam and fraud issues. 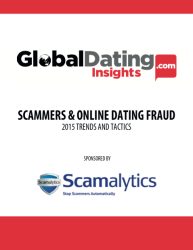 There is one important and essential research of Scamalytics and Global Dating Insights mentioned by David Evans in Dating Safety of February, 19. The report is quite informative regarding online dating business, what actions should agencies do to fight against criminals who interfere into this business and change the reputation of world online dating. They mention possible threats and tactics. Mainly dealing with apps, they analyze cyber crime schemes and how scammers usually get around the security systems of modern dating sites and apps. There is important to point out that blocking scam and fraud spreading through online dating will save the whole industry itself, not only wallets and hearts of lonely and desperate people.